eBooks are are the latest trend in digital technology. Despite being an old concept, the recent surge in popularity of electronic reading devices such as the Amazon Kindle, has made books the next target for digitization. A large number of commercial books are now available in various digital formats. In fact even magazines and newspapers are now available in electronic format. One of the major advantages of electronic books is that you don't need hundreds of shelves to hold a library. While you are not limited by physical space, and hard drive storage is cheap and vast enough to hold as many books as you want, the problem lies in managing your collection. If you are one who has a vast collection of books you are likely to need an application to manage your eBooks just as you have an application to manage your music. Calibre is certainly one of the most comprehensive tool for this task. If you have an eBook reading device, you will be pleased to know that Calibre supports all popular eBook readers. Being an open source application, it does not have allegiance to any one format or device. Instead it supports importing from many eBook formats and even allows conversion from one format to to another. If a book you have is not in a format supported by your reader, Calibre will probably be able to convert it for you before sending it to your device. 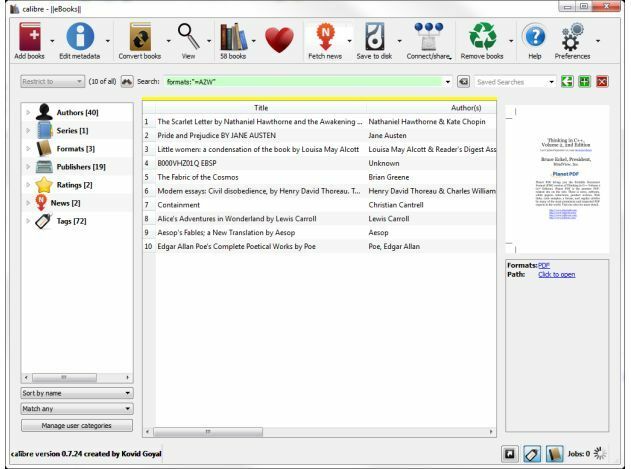 Calibre will automatically manage your eBook library arranging your eBooks on your hard disk by Author and title. If you have an eBook which happens to have incomplete information, such as missing tags, publisher, publish date etc, it will be able to automatically download this information by searching based on the title and author metadata on the file. It can also download covers for your eBook in case they are missing. The application also makes is very easy to browse your eBook collection. You can browse your library by Author, Series, Format, Publisher, Ratings, News or Tags. In each case you can press Ctrl to make multiple selections and get exactly the result you are looking for. If nothing else, you can use the search option. You can even choose to save searches so you can quickly access them any time you want. Calibre also includes an eBook viewer which serves its task well. While it may not give as many features as many other eBook reading applications, it is not necessary to use Calibre for this task. Not only can you read eBooks you already have, but Calibre can be used as a News fetching and reading application as well! 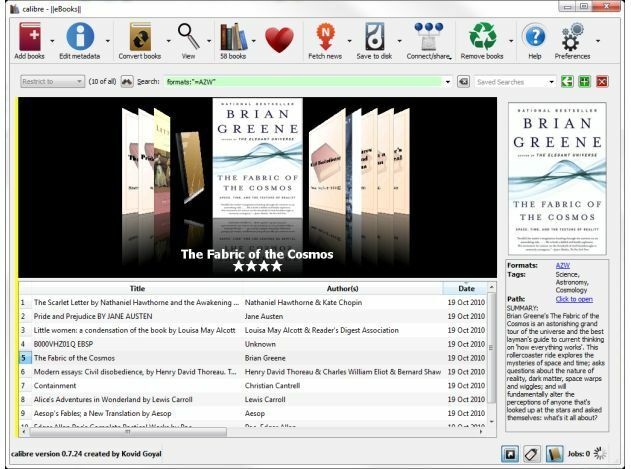 It comes pre-configured with hundreds of news sources, and Calibre can be set to regularly download news stories from the configured sites, and convert them to an EPUB eBook that automatically gets added to your library. These eBooks are complete with bookmarks and perfect for reading on any device. Calibre also includes another useful feature for connecting to iTunes, with which it can compatible files to your iTunes Library. Finally, Calibre includes a server for serving your eBooks over the internet! The library server will let you search and access your eBooks from anywhere. Calibre has many more features than we have discussed here, and it is currently in active development. The only caveat we could find with this application is that it is at times unstable. However even so, we never lost any data, nor did we damage any eBooks while we used it. Calibre is a free application which is available for Windows, Linux and Mac OSX. You can download it from here.